Welcome to paradise! The Sonoran Sun Resort is as close to the beach as you can get and has all the amenities of a luxury resort. The resort includes an indoor/outdoor restaurant and bar. Three pools including a kiddie pool and one heated pool, two Jacuzzis, swim up bar, walk out beach with palapas, mini mart, large fitness room, business center and 24 hour gated security. In November 2017 we completed remodeled this luxury, beautifully decorated three bedroom condominium with all new furniture, bedding and decor. In additional each room now has a king size bed. 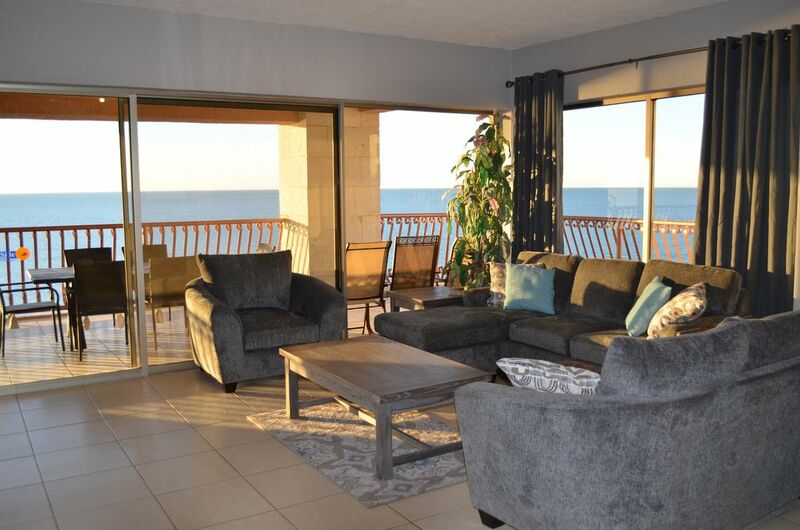 The condo includes over 1650 square feet of living space, a huge 700 square foot wrap around balcony and panoramic glass door walls in the living room and dining room to offer 180 degrees of incredible views of Old Port, Sea of Cortez, and Cholla Bay. The balcony can be accessed from the master bedroom, central living area and dining area. The balcony has a table with seating for six as well as two lounge chairs. The fully-equipped kitchen features granite counter tops, new stainless steal whirlpool appliances, coffee maker, toaster, blender, all cooking utensils, pots, pans, dishes, glassware and bottled water. The dining table and chairs has seating for six. The living room has comfortable seating for everyone and a full size sleeper couch with chaise lounge. There is a LCD 50" curved screen smart television in the living room with direct TV satellite broadcasting both Phoenix local and Spanish language broadcasts, DVD player, XM Radio, and CD player, Wi-Fi in the unit. The master suite includes a king size bed, LCD flat screen TV with DVD player, dual sinks, huge walk in closet, travertine marble soaking tub/shower and slider doors to the patio. The two guest bedrooms each include king size beds, TV and large windows with a view. The windows open up to allow a nice breeze and the sound of the ocean while you sleep. All the bedrooms have new luxurious, high quality mattresses for a good night sleep. The laundry room has a full size washer and dryer. Pak-n-play with foam pad (you need to provide sheet) and portable highchair are in the unit. We do not rent to college students over Spring Break. Note: Our rental company management requires the person who checks in to be age 25 or older. The resort monitors the number of guests in the unit. Any guests in excess of what is noted on the reservation will be asked to immediately leave the resort. All guests are required to were a wrist band for access to the pool. Extra fees applies to over 6 guests in the condo. 1 of the pools is heated. Beautiful condo! Perfect for our family of 5! Beautiful condo and resort. Layout of unit was perfect for our family of 5. The view was breathtaking, we will consider returning just as soon as it is possible. Resort was very nice and clean. Restaurant food and service was great. We spent a lot of time in the ATV’s across the street and got a good feel for The town. Thank you so much David and Torey for opening your home to us! My friends and I rented this condo over my birthday weekend recently and it was great overall. The wrap around balcony has an unobstructed view of the Sea of Cortez which was a huge plus. We all really liked having a convenience store onsite as well. Huge plus given the location. Would definitely rent again and would recommend. We had fun in the Sun! If you are a beach lover this is the place to stay! Very friendly staff and clean place. Plenty of room and a beautiful wrap around balcony! We hope to make it back someday! We are so glad you enjoyed your stay in our condo. Great property. Great view! Great location. Overall we were quite pleased with this property/unit. The good: The view was spectacular. The unit was very easy to reach from where you park. The unit had all the "furnishings" one would expect (i.e. coffee maker, plates, cups, etc). The property itself was very nice. The pool water was unusually warm which we thought was weird, but was well kept with a nice swim up bar. The restaurant on the property was great for breakfast during the week. They have a small convenience store on site which came in handy for extra supplies when needed. The location is also close to a few other restaurants/bars which were quite fun. The unit had a great layout for multiple guests. Constructive Criticism: For being such a nice place we were a bit disappointed with the bed/bedding in all of the rooms. The beds were not very comfortable (even if you like a "firm" mattress) and the pillows/comforter/etc. felt and seemed quite "cheap". The guest bedrooms DEFINITELY need a fan because they can get very stuffy if you do not leave a door open at night. The main patio door needs attention because it was nearly impossible to open and close (a simple maintenance matter I am sure). Overall we were quite pleased. The beds/bedding/fan is the only thing I think should be addressed for those wishing to stay for longer than a couple of nights. That is the ONLY reason we subtracted one star. Condo is beautiful, with beautiful views. Conveniently located, and owners are VERY easy to work with. Heated pool and Jacuzzi were awesome. Kitchen well stocked, all the rooms clean, and staff VERY friendly. Will for sure rent from these owners again. Couldn't have been happier. We recently had the pleasure of staying in this unit with a group of families and it was perfect! The condo is beautiful (along with it's views! ), it is very well maintained and incredibly spacious. The resort, as well, is beautiful and everyone on staff were delightful. The owners were a pleasure to work with and made everything incredibly easy. We can't wait to stay here again! NOTICE: Higher rates apply to holidays, Spring Break and Circus Mexicus Holidays: 3 night minimum stay 4% VRBO Credit Card Processing Fee included in taxes.